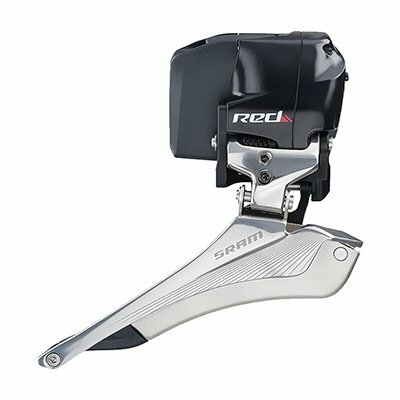 Tthe SRAM Red eTap Front Derailleur ditches mechanical actuation for good in favor of ultra-precise electronic shifts. This particular derailleur benefits from SRAM's Yaw technology, which is carried over from SRAM's mechanical groups for a better shifting experience. Yaw technology rotates the cage ever-so-slightly as the chain runs across the cassette for an optimal chain line without pesky rub that's the bane of cyclists seeking quiet drivetrain operation and precise shifts without hesitation. The Red eTap Front Derailleur communicates wirelessly with SRAM's AIREA network housed within the Red eTap rear derailleur for an optimal wireless set-up without cables for a cleaner aesthetic and instantaneous shift actuation. It houses its very own battery pod that lasts an impressive 1000 kilometers between charges (that's approximately 620 miles! ), meaning you won't have to worry about charging it very often. In fact, you'll probably only charge it every month or two, depending on how often you ride. This front derailleur is compatible with SRAM X-GlideR 11-speed chainrings, such as those of Red, Force 22, and Rival 22 cranksets.